Plasmodium falciparum is a protozoan parasite, one of the species of Plasmodium that cause malaria in humans. It is transmitted by the female Anopheles mosquito. This species causes the disease's most dangerous form, malignant or falciparum malaria. It has the highest complication rates and mortality. Around the world, malaria is the most significant parasitic disease of humans and claims the lives of more children worldwide than any other infectious disease. The 2015 World Health Organization report found 214 million cases of malaria worldwide. This resulted in an estimated 438,000 deaths. Rates of infection decreased from 2000 to 2015 by 37%, but increased from 2014's 198 million cases. In sub-Saharan Africa, over 75% of cases were due to P. falciparum, whereas in most other malarial countries, other, less virulent plasmodial species predominate. Almost every malarial death is caused by P. falciparum. Of the six malarial parasites, P. falciparum causes the most-often fatal and medically severe form of disease. Roughly 50% of all malarial infections are caused by P. falciparum. Malaria is caused by an infection with protozoa of the genus Plasmodium. The name malaria, from the Italian mala aria, meaning "bad air", comes from the linkage suggested by Giovanni Maria Lancisi (1717) of malaria with the poisonous vapours of swamps. This species' name comes from the Latin falx, meaning "sickle" and parere meaning "to give birth". The parasite was first seen by Laveran on November 6, 1880, at a military hospital in Constantine, Algeria, when he discovered a microgametocyte exflagellating. Patrick Manson (1894) hypothesised that mosquitoes could transmit malaria. This hypothesis was experimentally confirmed independently by Giovanni Battista Grassi and Ronald Ross in 1898. Grassi (1900) proposed an exerythrocytic stage in the lifecycle, later confirmed by Shortt, Garnham, Covell and Shute (1948), who found Plasmodium vivax in the human liver. Since 1900, the area of the world exposed to malaria has been halved, yet two billion more people are presently exposed. Morbidity, as well as mortality, is substantial. Infection rates in children in endemic areas are on the order of 50%. Chronic infection has been shown to reduce school scores by up to 15%. Reduction in the incidence of malaria coincides with increased economic output. While no effective vaccines are known for any of the six or more species that cause human malaria, drugs have been employed for centuries. In 1640, Huan del Vego first employed the tincture of the cinchona bark for treating malaria; the native Indians of Peru and Ecuador had been using it even earlier for treating fevers. Thompson (1650) introduced this "Jesuits' bark" to England. Its first recorded use there was by John Metford of Northampton in 1656. Morton (1696) presented the first detailed description of the clinical picture of malaria and of its treatment with cinchona. Gize (1816) studied the extraction of crystalline quinine from the cinchona bark and Pelletier and Caventou (1820) in France extracted pure quinine alkaloids, which they named quinine and cinchonine. Attempts to make synthetic antimalarials began in 1891. Atabrine, developed in 1933, was used widely throughout the Pacific in World War II, but was unpopular because of the yellowing of the skin it caused. In the late 1930s, the Germans developed chloroquine, which went into use in the North African campaigns. Mao Zedong encouraged Chinese scientists to find new antimalarials after seeing the casualties in the Vietnam War. Chinese scientist Tu Youyou discovered Artemisinin in the 1970s based on a medicine described in China in 340 CE. This drug became known to Western scientists in the late 1980s and early 1990s and is now a standard treatment. In 1976, P. falciparum was successfully cultured in vitro for the first time, which facilitated the development of new drugs. A 2008 study highlighted the emergence of artemisinin-resistant strains of P.falciparum in Cambodia. In February 2015, the WHO confirmed that P. falciparum resistant to artemisinin therapies were detected in five countries in Southeast Asia; Cambodia, the Lao People’s Democratic Republic, Myanmar, Thailand and Viet Nam. Seasonal temperature suitability for transmission of P. falciparum. The Z(T) normalized index of temperature suitability for P. falciparum displayed by week across an average year. Infection in humans begins with the bite of an infected female Anopheles mosquito. Plasmodium sporozoites released from the salivary glands of the mosquito enter the bloodstream during feeding, quickly invading liver cells (hepatocytes). The immune system clears the sporozoites from the circulation within 30 minutes. During the next 14 days the liver-stage parasites differentiate and undergo asexual reproduction, producing up to 40,000 merozoites that burst from the hepatocyte. Other blood sporozoans, such as P. vivax, P. ovale and P. malariae, that infect humans and cause malaria do not have such a productive cycle for invasion. The process of bursting red blood cells does not have any symptoms, but destruction of the cells does cause anemia, since the bone marrow cannot compensate for the damage. When red blood cells rupture, hemozoin wastes cause cytokine release, chills and then fever. P. falciparum trophozoites develop sticky knobs in red blood cells, which then adhere to endothelial cells in blood vessels, thus evading clearance in the spleen. The adhering red blood cells may cause cerebral malaria by preventing oxygenation of the brain. Symptoms of cerebral malaria include impaired consciousness, convulsions, neurological disorder and coma. Additional complications from P. falciparum-induced malaria include advanced immunosuppression. Individual merozoites invade red blood cells (erythrocytes) and reproduce, producing 12-16 merozoites within a schizont. The length of this erythrocytic stage depends on the parasite species: an irregular interval for P. falciparum, 48 hours for P. vivax and P. ovale and 72 hours for P. malariae. The clinical manifestations of malaria, fever and chills, are associated with the synchronous rupture of the infected erythrocytes. The released merozoites invade additional erythrocytes. Not all of the merozoites divide into schizonts; some differentiate into sexual forms, male and female gametocytes. These gametocytes are taken up by a female Anopheles mosquito during a blood meal. Within the mosquito midgut, the male gametocyte undergoes a rapid nuclear division, producing eight flagellated microgametes that fertilize the female macrogamete. The resulting ookinete traverses the mosquito gut wall and encysts on the exterior of the gut wall as an oocyst. Soon, the oocyst ruptures, releasing hundreds of sporozoites into the mosquito body cavity, where they eventually migrate to the mosquito salivary glands. Because fusion of gametes, zygote formation and meiosis must occur in the mosquito gut for the parasite to complete its life cycle, P. falciparum is an obligate sexual organism. It is often self-fertilizing. Its population structure appears to predominantly reflect inbreeding. P. falciparum works via sequestration, a distinctive property not shared by any other Plasmodium. Within the 48-hour asexual blood stage cycle, the mature forms change the surface properties of infected red blood cells, causing them to stick to blood vessel walls (cytoadherence). This leads to obstruction of the microcirculation and results in dysfunction of multiple organs, such as the brain in cerebral malaria. Complicated malaria occurs more commonly in children under age 5 and sometimes in pregnant women. Women become susceptible to severe complicated malaria if infected by P. falciparum during their first pregnancy even if they live in hyperendemic areas. Susceptibility to severe malaria is reduced in subsequent pregnancies due to increased antibody levels against variant surface antigens that appear on infected erythrocytes. Blood smear from a P. falciparum culture (K1 strain - asexual forms) - several red blood cells have ring stages inside them. Close to the center is a schizont and on the left a trophozoite. 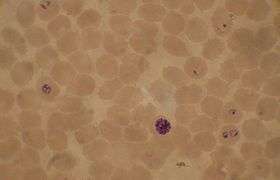 The preferred method to diagnose malaria and identify the species of Plasmodium is by microscopic examination of a blood film. Each species has distinctive physical characteristics. In P. falciparum, only early (ring-form) trophozoites and gametocytes are seen in the peripheral blood. It is unusual to see mature trophozoites or schizonts in peripheral blood smears, as these are usually sequestered in the tissues. The parasitised erythrocytes are not enlarged and it is common to see cells hosting more than one parasite (multiply parasitised erythrocytes). On occasion, faint, comma-shaped, red dots called "Maurer's dots" are seen on the red cell surface. The comma-shaped dots can also appear as pear-shaped blotches. In 1995 the Malaria Genome Project was set up to sequence the genome of P. falciparum. The genome of its mitochondrion was reported in 1995, that of the nonphotosynthetic plastid known as the apicoplast in 1996, and the sequence of the first nuclear chromosome (chromosome 2) in 1998. The sequence of chromosome 3 was reported in 1999 and the entire genome was reported on 3 October 2002. Annotated genome data are hosted in several databases including the UCSC Malaria Genome Browser, PlasmoDB and GeneDB. The roughly 24-megabase genome is extremely AT-rich (about 80%) and is organised into 14 chromosomes. Just over 5,300 genes were described. The presence of the parasite in human populations caused selection in the human genome, as humans developed resistance to the disease. Beet, a doctor working in Southern Rhodesia (now Zimbabwe) in 1948, first suggested that sickle-cell disease could offer some protection from malaria. This suggestion was reiterated by J. B. S. Haldane in 1949, who suggested that thalassaemia could provide similar protection. This hypothesis has since been confirmed and has been extended to hemoglobin C and hemoglobin E, abnormalities in ankyrin and spectrin (ovalocytosis, elliptocytosis), in glucose-6-phosphate dehydrogenase deficiency and pyruvate kinase deficiency, loss of the Gerbich antigen (glycophorin C) and the Duffy antigen on the erythrocytes, thalassemias and variations in the major histocompatibility complex classes 1 and 2 and CD32 and CD36. Individuals with sickle-cell anemia or sickle-cell trait have reduced parasitemia when compared to wild-type individuals for the hemoglobin protein in red blood cells. These genetic deviations of hemoglobin from normal states provide protection against the parasite. Individuals with sickle-cell trait and sickle-cell anemia are privileged because the red blood cell sticky knobs are altered. 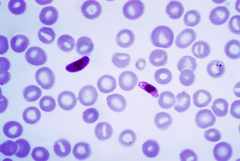 The merozoites of each parasite species that causes malaria invade the red blood cell in three stages: contact, attachment and endocytosis. Individuals suffering from sickle-cell anemia have deformed red blood cells that interfere with the attachment phase and P. falciparum and the other forms of malaria have trouble with endocytosis. These individuals have reduced attachment when compared to red blood cells with the normally functioning hemoglobin because of differing protein interactions. In normal circumstances, merozoites enter red blood cells through two PfEMP-1 protein-dependent interactions. These interactions promote the malaria inflammatory response associated with symptoms of chills and fever. When these proteins are impaired, as in sickle-cell cases, parasites cannot undergo cytoadherance interactions and cannot infect the cells; therefore, sickle-cell-anemic individuals and individuals carrying the sickle-cell trait have lower parasite loads and shorter time for symptoms than individuals expressing normal red blood cells. Individuals with sickle-cell anemia may experience reduced symptoms of malaria because P. falciparum trophozoites cannot bind to hemoglobin to form sticky knobs. Without knob-binding complexes red blood cells do not stick to blood vessel walls, protecting infected individuals from e.g. cerebral malaria. Individuals with sickle-cell deformities are less susceptible to the effects of Plasmodium parasite infections. Therefore, individuals expressing the genes and individuals carrying genes are selected to remain within the population. The incidence of sickle-cell anemia matches that of endemic regions for malarial infections. The closest relative of P. falciparum is P. reichenowi, a parasite of chimpanzees. P. falciparum and P. reichenowi are not closely related to the other Plasmodium species that parasitize humans, or indeed mammals in general. These two species were once thought to originate from a parasite of birds. More recent analyses instead suggest that the ability to parasitize mammals evolved only once within Plasmodium. Evidence based on analysis of more than 1,100 mitochondrial, apicoplastic and nuclear DNA sequences suggested that P. falciparum may in fact have speciated from a lineage present in gorillas. According to this theory, P. falciparum and P. reichenowi may both represent host switches from an ancestral line that infected primarily gorillas; P. falciparum went on to infect primarily humans, while P. reichenowi specialized in chimpanzees. The ongoing debate over the evolutionary origin of P. falciparum will likely be the focus of continuing genetic study. A third potential species that appears to related to these two is P. gaboni. This putative species was (as of 2009) known only from two DNA sequences and is not yet accepted as distinct. Molecular clock analyses suggest P. falciparum is as old as the human line; the two species diverged at the same time as humans and chimpanzees. However, low levels of polymorphism within the P. falciparum genome suggest a much more recent origin. It may be that this discrepancy exists because P. falciparum is old, but its population recently underwent a great expansion. Some evidence indicates that P. reichenowi was the ancestor of P. falciparum. The timing of this speciation is unclear at present, but it may have occurred about 10,000 years ago. More recently, P. falciparum has evolved in response to human interventions. Most strains of malaria can be treated with chloroquine, but P. falciparum is resistant. A combination of quinine and tetracycline has been used, but some strains are resistant to this treatment, as well. Various strains of P. falciparum are resistant to other treatments. Resistance depends on location. Many cases of malaria that come from the Caribbean and west of the Panama Canal, as well as the Middle East and Egypt, can be treated with chloroquine. Nearly all cases contracted in Africa, India and Southeast Asia are resistant to this medication and cases in Thailand and Cambodia have shown resistance to nearly all treatments. Often, strains develop resistance in areas where treatment protocols are less tightly regulated. Like most apicomplexans, malaria parasites harbor a plastid, an apicoplast, similar to plant chloroplasts, which they probably acquired by engulfing (or being invaded by) a eukaryotic alga and retaining the algal plastid as a distinctive organelle encased within four membranes. The apicoplast is an essential organelle, thought to be involved in the synthesis of lipids and several other compounds and provides an attractive drug target. During the asexual blood stage of infection, the essential function of the apicoplast is to produce the isoprenoid intermediate isopentenyl pyrophosphate. Gametocyte production likely has an adaptive basis: it increases when conditions for asexual reproduction of the parasite worsen (e.g. upon exposure to immunological stress and/or antimalarial chemotherapy). Artesunate plus tetracycline or doxycycline or clindamycin. Any of these combinations is to be given for 7 days. In Africa, the overall treatment failure was less for dihydroartemisinin-piperaquine when compared to artemether-lumefantrine and both drugs had polymerase chain reaction (PCR)-adjusted failure rates of less than 5%. However, in Asian countries, dihydroartemisinin-piperaquine was found to be better tolerated, but as effective as artesunate plus mefloquine. For pregnant women, the recommended first-line treatment during the first trimester is quinine plus clindamycin for 7 days. Artesunate plus clindamycin for 7 days is indicated if this treatment fails. Still, an ACT is indicated only if this is the only treatment immediately available, or if treatment with 7-day quinine plus clindamycin fails or given uncertain compliance with a 7-day treatment. In second and third trimesters, the recommended treatment is an ACT known to be effective in the country/region or artesunate plus clindamycin for 7 days, or quinine plus clindamycin for 7 days. Lactating women receive standard antimalarial treatment (including ACTs) except for dapsone, primaquine and tetracyclines. In infants and young children, the recommended first-line treatment is ACTs, with attention to accurate dosing and ensuring the administered dose is retained. In severe falciparum malaria, rapid clinical assessment and confirmation of the diagnosis is recommended, followed by administration of full doses of parenteral antimalarial treatment without delay with whichever effective antimalarial is first available. For adults, intravenous (IV) or intramuscular (IM) artesunate is recommended. Quinine is an acceptable alternative if parenteral artesunate is not available. artemether IM - should be used only if none of the alternatives is available, as its absorption may be erratic. Although an antimalarial vaccine is urgently needed, infected individuals never develop a sterilizing (complete) immunity, making the prospects for such a vaccine dim. The parasites live inside cells, where they are largely hidden from the immune response. Infection has a profound effect on the immune system including immune suppression. Dendritic cells suffer a maturation defect following interaction with infected erythrocytes and become unable to induce protective liver-stage immunity. Infected erythrocytes directly adhere to and activate peripheral blood B cells from nonimmune donors. The var gene products, a group of highly expressed surface antigens, bind the Fab and Fc fragments of human immunoglobulins in a fashion similar to protein A to Staphylococcus aureus, which may offer some protection to the parasite from the human immune system. Despite the poor prospects for a fully protective vaccine, it may be possible to develop a vaccine that would reduce the severity of malaria for children living in endemic areas. ↑ Rich, S. M.; Leendertz, F. H.; Xu, G.; Lebreton, M.; Djoko, C. F.; Aminake, M. N.; Takang, E. E.; Diffo, J. L. D.; Pike, B. L.; Rosenthal, B. M.; Formenty, P.; Boesch, C.; Ayala, F. J.; Wolfe, N. D. (2009). "The origin of malignant malaria". Proceedings of the National Academy of Sciences. 106 (35): 14902–14907. doi:10.1073/pnas.0907740106. PMC 2720412 . PMID 19666593. ↑ Perkins, D. J.; Were, T.; Davenport, G. C.; Kempaiah, P.; Hittner, J. B.; Ong'Echa, J. M. (2011). "Severe malarial anemia: Innate immunity and pathogenesis". International Journal of Biological Sciences. 7 (9): 1427–1442. doi:10.7150/ijbs.7.1427. PMC 3221949 . PMID 22110393. ↑ Perlmann, P; Troye-Blomberg, M (2000). "Malaria blood-stage infection and its control by the immune system". Folia biologica. 46 (6): 210–8. PMID 11140853. 1 2 "Malaria Fact sheet N°94". WHO. Retrieved 2 February 2016. ↑ WHO (2014). World Malaria Report 2014. Geneva, Switzerland: World Health Organization. pp. 32–42. ISBN 978-92-4156483-0. ↑ "World Malaria Report 2008" (PDF). World Health Organisation. 2008. p. 10. Retrieved 2009-08-17. ↑ Fuehrer, Hans-Peter; Noedl, Harald (2014-02-01). "Recent Advances in Detection of Plasmodium ovale: Implications of Separation into the Two Species Plasmodium ovale wallikeri and Plasmodium ovale curtisi". Journal of Clinical Microbiology. 52 (2): 387–391. doi:10.1128/JCM.02760-13. ISSN 0095-1137. PMC 3911344 . PMID 24478466. 1 2 3 Roberts & Janovy 2005. ↑ Trager, W; J B Jensen (1976-08-20). "Human malaria parasites in continuous culture". Science. 193 (4254): 673–5. Bibcode:1976Sci...193..673T. doi:10.1126/science.781840. PMID 781840. ↑ Noedl H, Se Y, Schaecher K, Smith BL, Socheat D, Fukuda MM (December 2008). "Evidence of artemisinin-resistant malaria in western Cambodia". N. Engl. J. Med. 359 (24): 2619–20. doi:10.1056/NEJMc0805011. PMID 19064625. ↑ Dondorp AM, Pongponratn E, White NJ (February 2004). "Reduced microcirculatory flow in severe falciparum malaria: pathophysiology and electron-microscopic pathology". Acta Trop. 89 (3): 309–17. doi:10.1016/j.actatropica.2003.10.004. PMID 14744557. ↑ Wilson RJ; Denny PW; Preiser PR; et al. (August 1996). "Complete gene map of the plastid-like DNA of the malaria parasite Plasmodium falciparum". Journal of Molecular Biology. 261 (2): 155–72. doi:10.1006/jmbi.1996.0449. PMID 8757284. ↑ Mockenhaupt, Ehrhardt & Otchwemah 2004. ↑ Yotoko, KSC; C Elisei (November 2006). "Malaria parasites (Apicomplexa, Haematozoea) and their relationships with their hosts: is there an evolutionary cost for the specialization?". Journal of Zoological Systematics and Evolutionary Research. 44 (4): 265–73. doi:10.1111/j.1439-0469.2006.00377.x. ↑ Escalante, AA; E Barrio, FJ Ayala (1995). "Evolutionary origin of human and primate malarias: evidence from the circumsporozoite protein gene". Molecular Biology and Evolution. 12 (4): 616–26. ISSN 0737-4038. PMID 7659017. ↑ Hartl, DH (January 2004). "The origin of malaria: mixed messages from genetic diversity". Nature Reviews Microbiology. 2 (1): 15–22. doi:10.1038/nrmicro795. PMID 15035005. ↑ Yeh, Ellen; DeRisi, Joseph L. (2011-08-30). "Chemical Rescue of Malaria Parasites Lacking an Apicoplast Defines Organelle Function in Blood-Stage Plasmodium falciparum". PLOS Biol. 9 (8): e1001138. doi:10.1371/journal.pbio.1001138. ISSN 1545-7885. PMC 3166167 . PMID 21912516. ↑ Buckling AG, Taylor LH, Carlton JM, Read AF (April 1997). "Adaptive changes in Plasmodium transmission strategies following chloroquine chemotherapy". Proc. Biol. Sci. 264 (1381): 553–9. doi:10.1098/rspb.1997.0079. PMC 1688398 . PMID 9149425. Gardner, MJ; Hall, N; Fung, E; White, O; Berriman, M; Hyman, RW; Carlton, JM; Pain, A; Nelson, KE (2002). "Genome sequence of the human malaria parasite Plasmodium falciparum". Nature. 419 (6906): 498–511. Bibcode:2002Natur.419..498G. doi:10.1038/nature01097. PMID 12368864. Allison, A.C. (February 1954). "Protection Afforded by Sickle-cell Trait Against Subtertian Malarial Infection". Br Med J. 1 (4857): 290–4. doi:10.1136/bmj.1.4857.290. PMC 2093356 . PMID 13115700. Allison, AC (1964). "Polymorphism and Natural Selection in Human Populations". Cold Spring Harb. Symp. Quant. Biol. 29: 137–49. doi:10.1101/sqb.1964.029.01.018. PMID 14278460. Mockenhaupt, FP; Ehrhardt, S; Otchwemah, R; et al. (May 2004). "Limited influence of haemoglobin variants on Plasmodium falciparum msp1 and msp2 alleles in symptomatic malaria". Trans. R. Soc. Trop. Med. Hyg. 98 (5): 302–10. doi:10.1016/j.trstmh.2003.10.001. PMID 15109555. Roberts, Larry S.; Janovy, John (2005). Foundations of Parasitology (7th ed.). McGraw-Hill Education (ISE Editions). ISBN 0-07-111271-5.